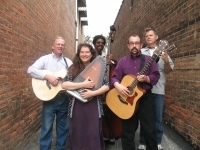 Long Road, (l-r) Bob Sandham, Celia Hollander Lewis, Ray DeForest, David Budin and Kevin Richards, all with Heights roots, performs its all-‘60s folk show at Cain Park on Sunday, June 29, at 2 and 7:30 p.m.
For years I sat in the audience at Cain Park concerts, not missing being on stage. Then, all of a sudden, I started playing concerts at Cain Park. I played in rock and folk groups when I was a kid at Coventry School, and played professionally, starting as a teenager (at Roosevelt Junior High and Heights High), until the age of 31, in Cleveland and New York. Then I quit for what I thought would be forever. But after many years, I decided to have a reunion concert with my singing partner from the 35 years earlier, Denise Johnson. We performed our “David & Denise” show at Cain Park. I had enlisted the aid of three terrific musicians to back (and/or cover) us up. People really liked the “60s” quality of the show: five musicians playing acoustic instruments and singing well-written, meaningful songs in harmony. I’m not sure it would have worked quite as well in other suburbs; it might be a Cleveland Heights thing. So I decided to do a real ‘60s show the next season at Cain Park. I put together another group of great musicians – that is, four great musicians, plus me – and we performed a show last summer called “Can’t Help But Wonder Where I’m Bound: A 1967 Coffeehouse Concert,” consisting of songs you would have heard in any folk club in 1967. The group, Long Road is fairly Heights-centric: Kevin Richards, Ray DeForest and I live here; Bob Sandham and our newest member, Celia Hollander Lewis, who both also used to live here, now live in Chesterland and Athens, Ohio, respectively. Last year’s show sold out Cain Park’s Alma Theater, so we did the show again at the Kent Stage. Then we played at Nighttown twice and the Kent Stage again. Now we’re coming back to Cain Park to perform the sequel – “Can’t Help But Wonder Where I’m Bound – Part 2: A 1968 Coffeehouse Concert” – on Sunday, June 29, at 2:00 and 7:30. This time we’re doing songs you would have heard in 1968, but not any of the ones we did last year. And, like last year’s show, these shows are fund-raisers for the Cleveland Heights-based education organization Roots of American Music (ROAM). David Budin is a freelance writer living in Cleveland Heights.